According to the news sources, which came out recently a couple of days back, Apple Inc. has ignited another patent war on Samsung. Uniqueness is to notice search giant Google being directly involved for the first time. Here we are quoting few lines from The New York Times, Apple is seeking about $2 billion in damages from Samsung for selling phones and tablets that Apple says violate five of its mobile software patents; has Google in crossfire. This article originally appeared on PC-Tablet. Taking an advantage of this situation and making Samsung and Google to suffer in San Jose's courtroom, technology giant Apple Inc. has officially launched the world's first innovative iFoot Air Footwear - An ongoing effort to redefine the entire fashion industry worldwide. The project initially kick-started approximately 16 to 18 hours back, when a group of 3 idiots on Twitter had an innovative tweetcusion (discussion on Twitter) regarding a technology that simplifies a walking habit of a common man on earth. The Twitter conversation caught eyes of Apple and this is how innovation took place. A face behind this mysterious leg of a common man (or perhaps woman, as seen in the above picture) has not been revealed by Apple. However, a group of (not so intelligent) journalists has been caught bugging company officials on TrueCaller and Instagram. However, as we have always been a daily dose of PC and Tablets, we will not disappoint our readers. Talking about the technical details, iFoot Air Footwear comes with blue, red, yellow and green LEDs to make this project one of those disco shoes, this time for mom and dad, and yes grandma and grandpa. Inspired by Subway Surfers, Apple has also provided an application on iTunes, which will transform your iFoot into the Super Sneakers. "You can do that easily from your iPod Shuffle, while enjoying to your favorite songs. Isn't it cool?" Apple asks. It even includes an upgraded version of Siri voice assistant, known as Angry Sir. Whenever you will go overboard, Angry Siri will literally scream aloud, "Hey you! Stand-by!" However, according to our sources, Apple might face some legal charges from companies like Google and Twitter for stealing their "things". Search giant Google claims that colors of the LEDs mounted on Apple's iFoot have been stolen from its official company logo. Followed by this launch, search giant Google updated the status on WhatsApp crying, "They stole our colors! If you don't believe us, install Google Chrome right now! Set the default page as Orkut.com and there you will find the same colors in our Google logo :'("
At the other side, Twitter is also planning to file a lawsuit against Apple. This particular incident made Twitter to remove its limit of 140 characters to be tweeted on the go. Twitter's official account tweeted, "This is our platform! When the idea was initially discussed on Twitter, we had all the rights to decide what to do with that. If our Twitter employees would have not been busy placing sponsored tweets that time, we would have launched this product." Surprisingly, Subway Surfer has no complaints against Apple for using one of the important part of the game, that too without giving a credit. One of the sources close to Subway Surfers messaged us on Facebook saying, "People have already fed up of tirelessly running and jumping across those silly trains in the game. At least Apple would help Subway Surfers to boom once again." 4 LED indicators - Blue, red, yellow, and green. App that transforms iFoot into Super Sneakers. Apple logo on the top. Apple that you can eat whenever you are hungry. "Hungry? Grab this Apple!" - This is the tagline. A disco light that makes you dance anytime, anywhere. Apple's iFoot Air Footwear costs $59 for a single shoe and $99 for a pair. 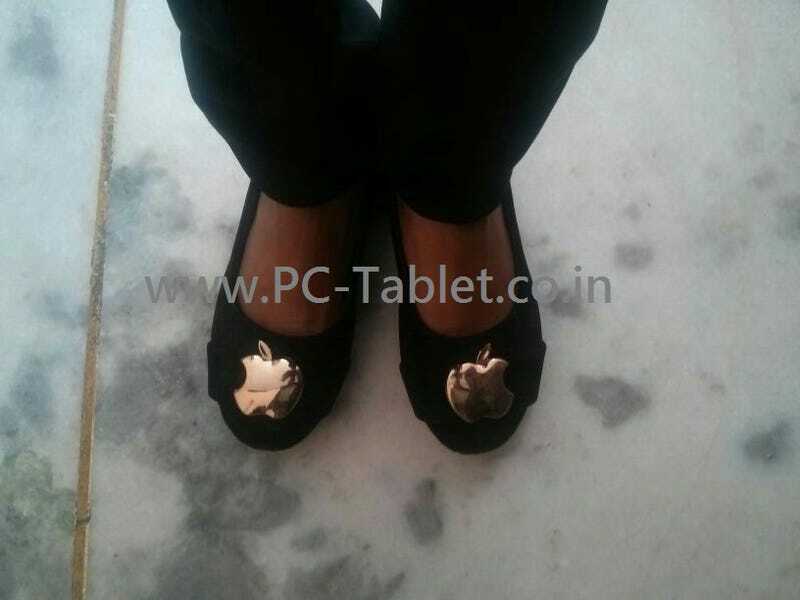 According to Apple, single shoe can be used as a pendant that you can wear around your neck.